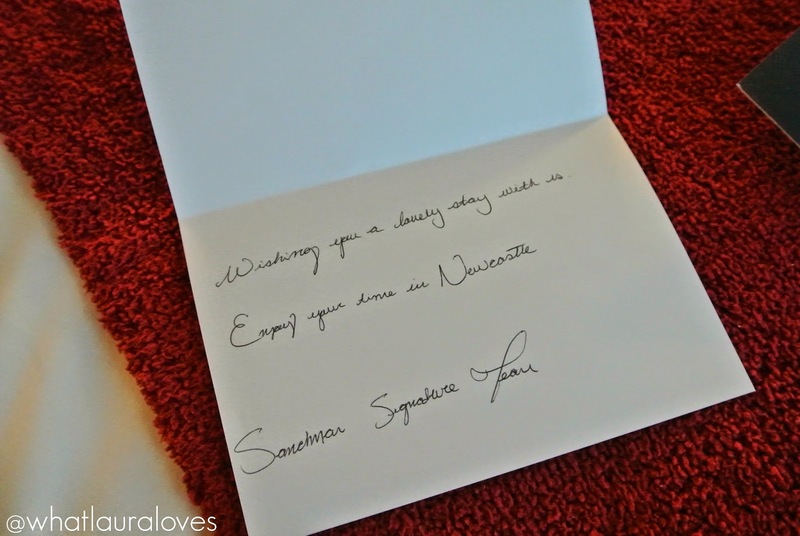 Back in February, I was invited along to a press day to see what the Sandman Signature Hotel had in store for guests staying at their top Newcastle residence on Valentine’s Day. You can read all about the package and what I thought about it here. My hubby actually read my post and gained some inspiration for our own Valentine’s Day plans. 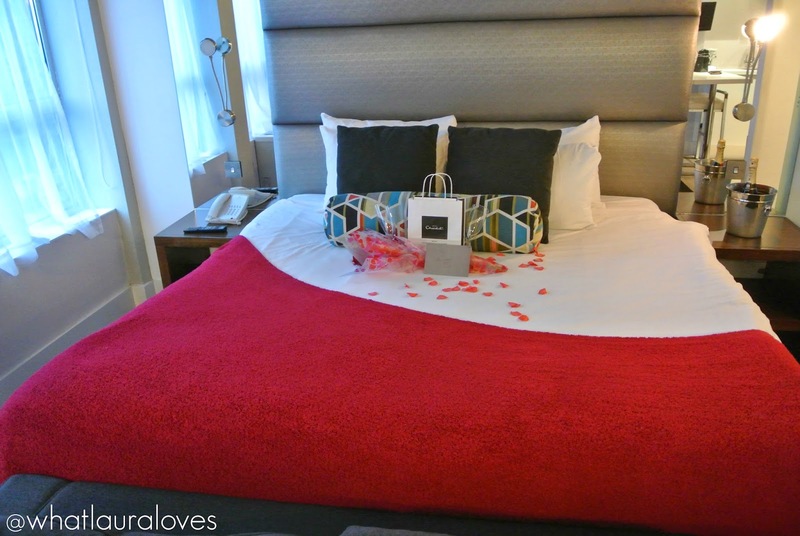 He booked us a night away at the Sandman Signature Hotel with the Valentine’s Day Loved Up Package. I was so excited as I’d felt really lucky to have been invited along to the preview day but a little saddened that I had to leave and wouldn’t be able to spend the night! I thought that it would be handy to review the hotel for you all and to tell you about our experience while staying there. 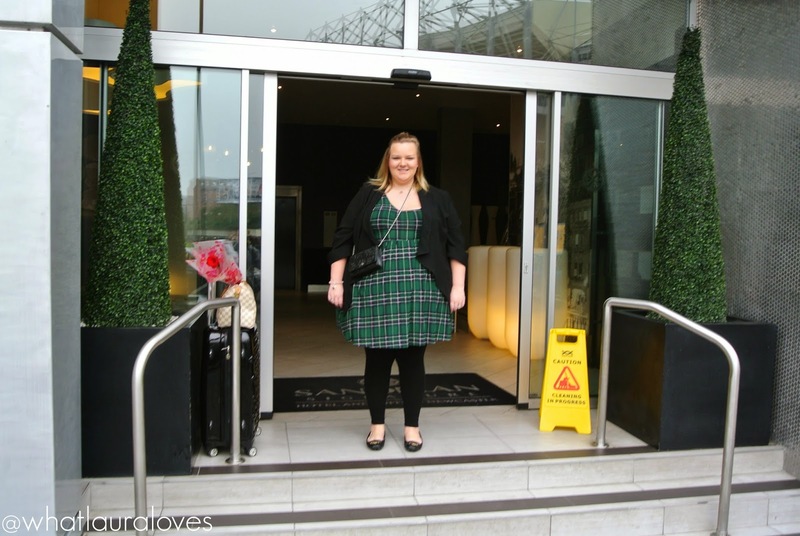 Its all well and good visiting a hotel for an event and it does give you a great insight into what to expect when staying at a hotel but I do think the proof really is in the pudding when it comes to hotels; paying and staying over to see what it is really like. 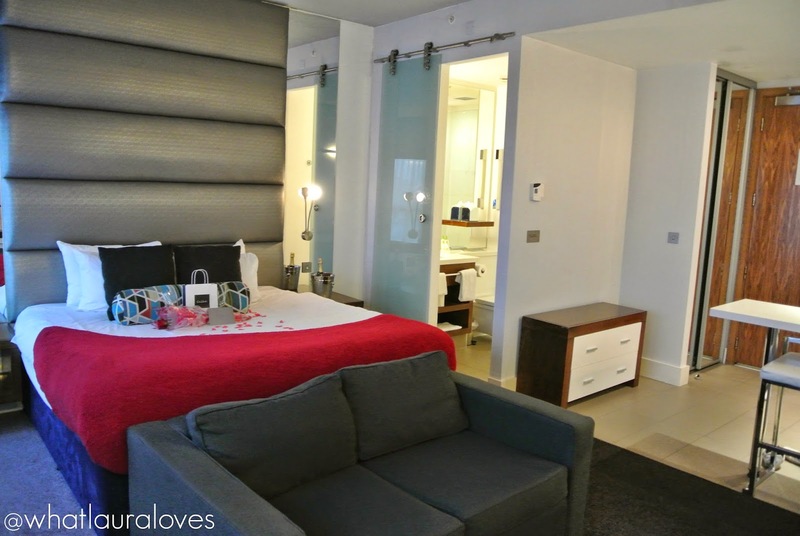 I wanted to wait a while to review the hotel and our stay separately, away from the madness of Valentines Day as lets face it, it all gets a little loved up around here in February and I didn’t want to overload you all. A hotel is not just for Valentine’s Day stays and I really think that the Sandman Signature is great all year round. So let’s hop into the review. 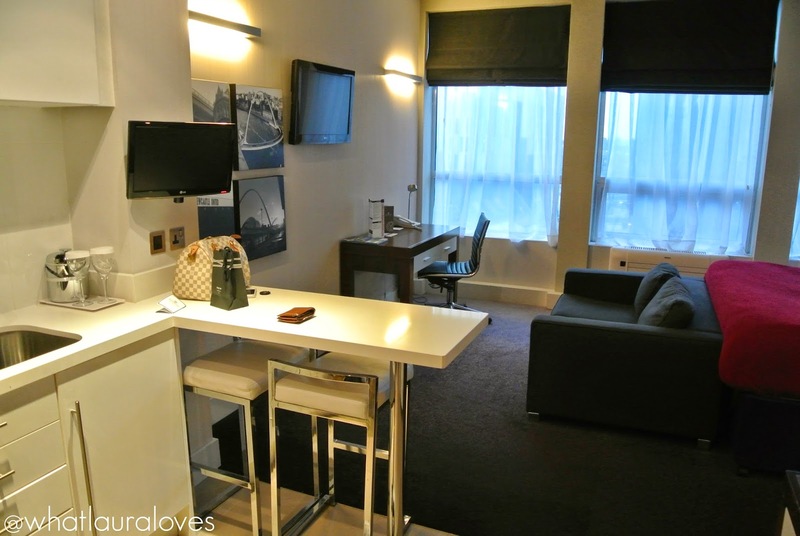 Situated in Newcastle City Centre, right next to St. James’ Park football stadium, you couldn’t get any closer to the action. There’s Stowell Street literally across the road which is Newcastle’s China Town, packed full of delicious Chinese restaurants. You’ll also find The Gate there too which has a fabulous casino and cinema as well as a whole host of restaurants and bars to choose from and for the shopaholics amongst us, you’re literally minutes away from some of the best shops Newcastle has to offer. Directly across the road from the hotel is St James’ metro station and a car park so you can travel with ease to the hotel. If you’re coming to Newcastle by train, simply get off at Central Station and either walk up to the hotel or hop on the metro to St James. If you’re driving, you’ll find ample parking in the metro station car park with bays reserved for Sandman Signature customers. Parking is affordable and we paid for ours by phone for ease. I always say that I’m like the queen as I never carry cash (haha!) so being able to pay by phone is very useful to me. 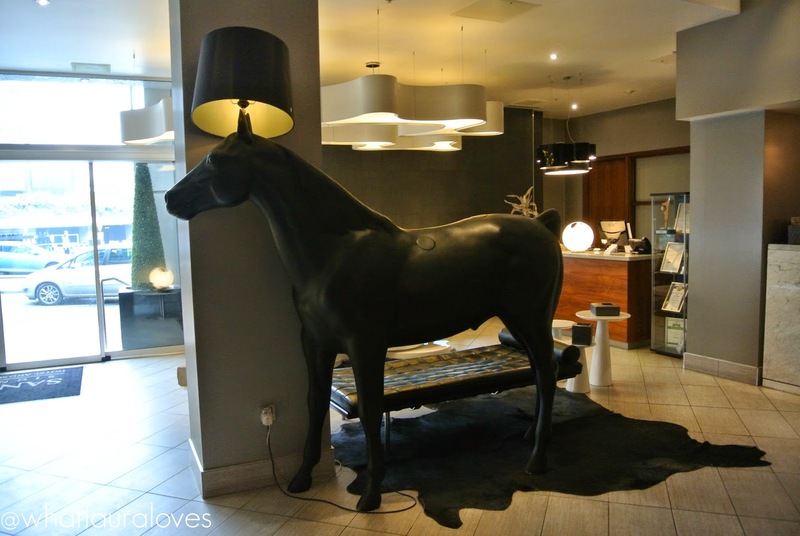 Stepping into the hotel immediately put us at ease from the busy streets into a calm foyer decorated with modern, quirky furniture. There is something to look at, every where you turn your head and plenty of seating space. 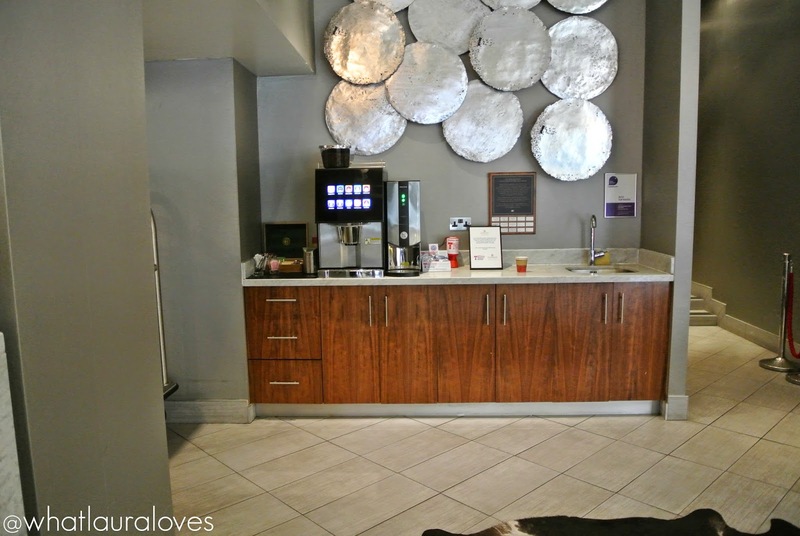 If you should need to refresh, perhaps after a long journey, a day at a work conference or a shopping trip, there’s a complimentry drinks station where you can help yourself to a number of different coffees and tees. Just off from the reception is the hotel restaurant and bar, the Shark Club Gastro Bar. This is essentially a sports bar that does get busy during the day, especially if there’s a match on. At night it plays loud music and while it does serve food, it is very much a bar atmosphere. We had a look around but decided that it wasn’t really suitable for a meal out as a couple so we booked supper at an Italian restaurant instead. I think that this is the kind of bar that many men would like if they were away on a boys weekend. Check in was quick, efficient and thorough. The lady on reception was very friendly, polite and greeted us with a smile which we really appreciate. Manners cost nothing yet its amazing the amount of people who don’t exercise this common courtesy when in restaurants and hotels. All of the staff that we spoke to at the Sandman Signature were nothing but courteous and friendly, their service was second to none. The receptionist went through the details of our package with us, some notable points about the room and the hotel, then gave us our key and directed us over to the lifts. As we were about to call the lift, we bumped into PR guru Claire Barber and her partner. Her public relations work is second to none and she’s enjoyed many successes with some very notable clients. If you’re looking for representation and media coverage for your brand or business then I’d highly recommend getting in touch with her. Heading up to our hotel room filled us with anticipation. The lift and corridors feel luxe and modern and we hoped our room would be as great as the preview room was on the press day. 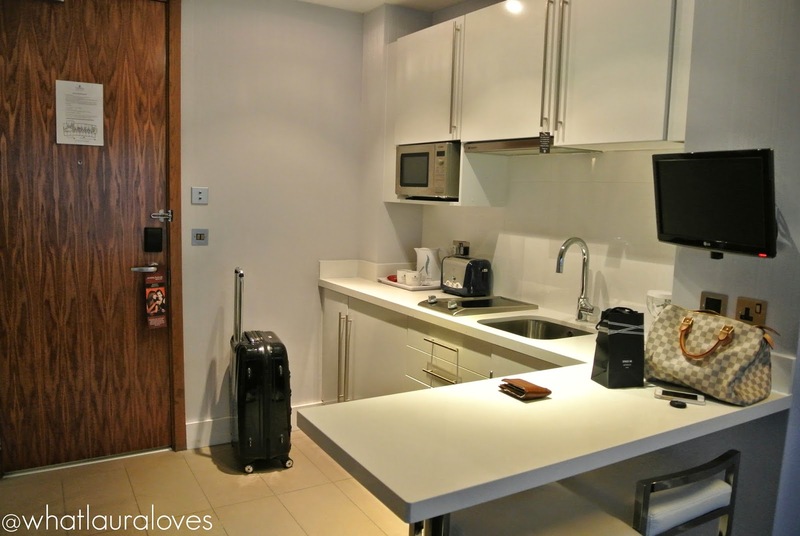 We had one of the king rooms with the kitchen included and it was super clean, light and inviting upon arrival. The kitchen is a great facility if you’re there on a girls weekend away for putting nibbles on before a night out, after a long day at work as a corporate guest as eating out constantly can be a pain, or if you’re wanting to save money while staying away from home by cooking for yourself. The Sandman Signature are also happy to stock your fridge with any ingredients that you need if you give them some prior notice. This doesn’t cost any extra whatsoever, they just go to Waitrose for you, buy the food and drinks that you have requested, including alcohol, and then you are billed for the receipt from the supermarket. They don’t add a fee on top. The room was everything that I expected having seen it at the press preview but it was extra special as I knew that it was ours for the night. There’s plenty of space in the rooms at the Sandman Signature so while we were only there for the night, I’m sure the rooms would be extremely comfortable and spacious enough for longer stays. Upon entering the room, there was mirrored wardrobes on the right hand side with an iron, ironing board and electronic safe inside. While we had no worries about security while staying at the hotel, I did like this feature and that it came as standard in the room. The iron was powerful and did a great job at ironing out creases in my husbands shirt after he had less than carefully packed it in our case. Next to the wardrobe was more storage with pull out draws that you could also put things on top of. When I stay in a hotel, regardless of how long it is for, I like to unpack and put my things away. I hate that feeling of being unsettled and at the Sandman, I was able to settle in and relax quickly. The kitchen area of the hotel came fully stocked with cutlery, utensils and crockery, a sink, fridge, microwave, toaster and cooking hob. Complimentry tea and coffee making facilities as well as biscuits were also provided free of charge which helped to give my husband his caffeine fix; he does love a good cup of coffee or two! 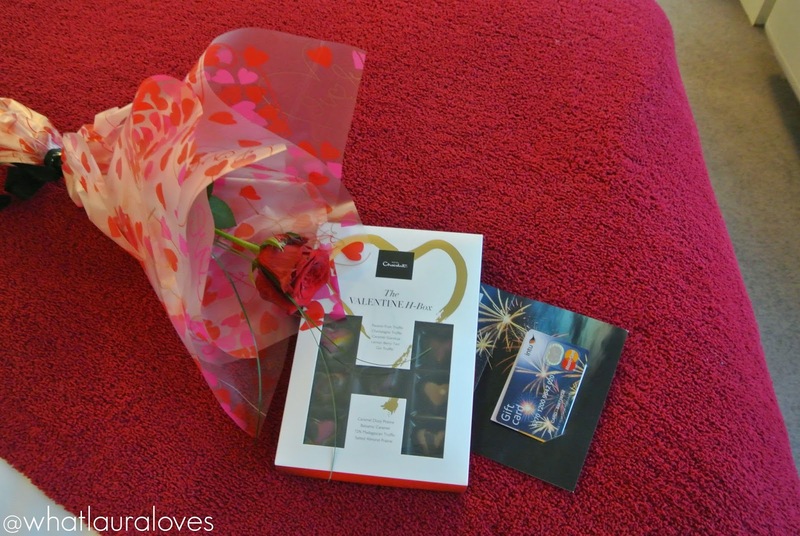 As part of our package, we were treated to a single stem rose, Hotel Chocolat chocolates, a £50 gift card for Eldon Square and a bottle of Moet as well as rose petals on the bed. These were all there ready for us when we got to the room and it was a lovely surprise to see everything set out. What I thought was a really nice touch was a card from the hotel to us, wishing us a lovely stay at the hotel and in Newcastle. While the room was fully equipped with everything that we needed, something personal like this is an extra special thoughtful touch. I’m someone who really appreciates a light and airy room and thats definitely what you get at this hotel. One side of our room faced out onto the city of Newcastle and was almost fully floor to ceiling with windows which let huge amounts of natural light into the room, even though it was a very overcast day. There are plenty of lights in the room that are bright and white, especially in the bathroom which makes applying makeup easy. There’s nothing worse than getting ready in a dimly lit room to find that you’ve applied too much bronzer, am I right girls? There was plenty of switches for the lights in the room, including next to the bed which I always like as I hate having to get out of bed to turn off the lights. When I want to sleep, I want to do just that! 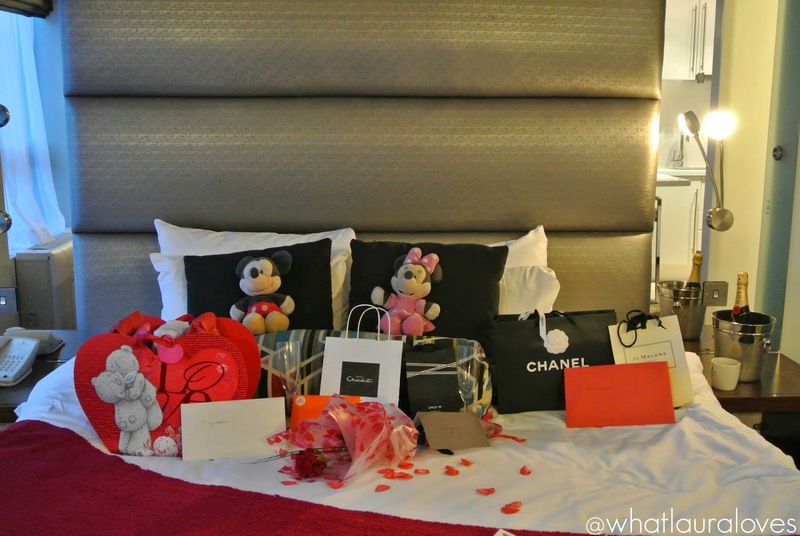 We were staying at the hotel to celebrate not only Valentine’s Day but our anniversary of being together too and we took our gifts and cards along with us to exchange while we were there. We set them out on the bed and opened them while enjoying our yummy chocolates. The bed was big and very comfortable. We sat up in bed while opening our gifts and had the TV opposite on in the background. The padded headboard was very supportive and comfortable when sitting up which is something that I don’t often think about when staying in hotels but I will from now on as it was a welcome feature! The room was adequately equipped for completing paperwork or working at a laptop, with a large desk and ergonomic chair, plenty of power points and desk lighting. It would be absolutely ideal for a corporate guest staying on business, especially as the hotel provides complimentry internet access. We were feeling hungry but it was only mid afternoon and while we were planning on having a meal out later, we wanted something to nibble on sooner. The Sandman Signature offer a great in-room dining selection which is the same menu that they serve downstairs in the hotel restaurant/bar. Room service is ordered directly from the room but we did have some trouble getting through to the 24 hour in-room dining telephone line. This was easily resolved with a quick phone call to reception who placed our order for us. We doubled up on a portion of their chicken wings, which were on the menu as an appetiser, to share between us. They were delivered promptly by another member of staff who was again, friendly and attentive. The wings arrived covered with a silver cloche on a tray with plenty of cutlery, condiments and napkins. There was a choice of flavourings for the wings and we went for the Suicide ones which were super, super hot and very yummy. They came with a creamy blue cheese sauce that my hubby loved and some carrot sticks. The portion was far larger than we both expected and kept us full right up until supper time. 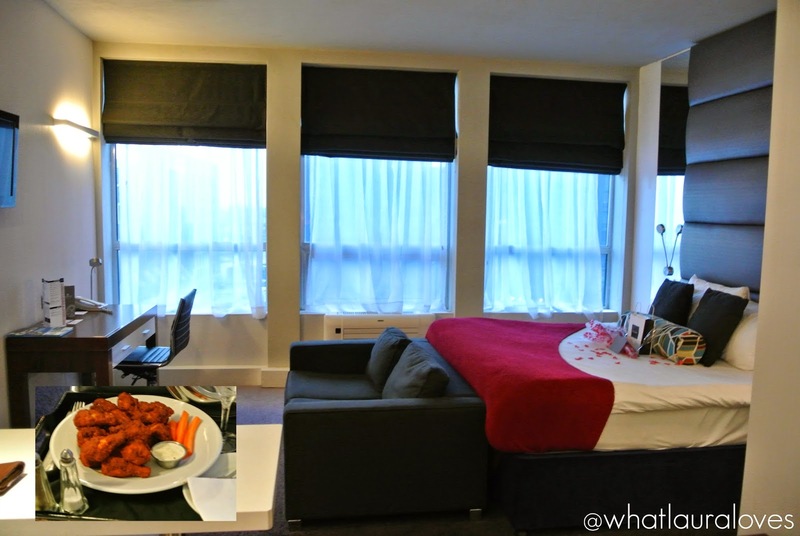 We enjoyed our wings along with a couple of glasses of bubbly each while sitting on the sofa watching the tv. It was nice to be able to switch off from the outside world and relax for a while. I think a little side table or tray stand would have been handy as we had to use the chair to rest our plate and glasses on. While there is a breakfast bar to sit at and a small TV in the kitchen, we found the sofa to be far more comfortable to sit on. Later into the evening we began to get ready for supper. 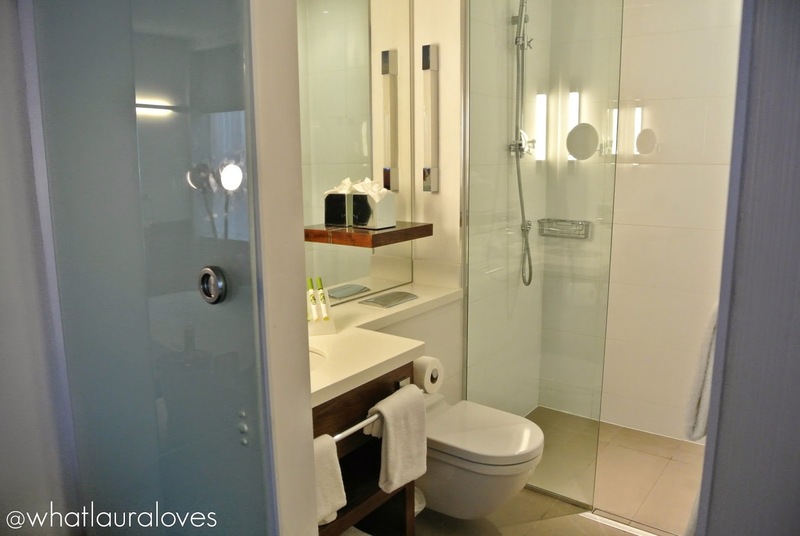 The bathroom has to be one of my favourite parts of the room as it was gleaming and bright white, with plenty of space for me to lay out all of my toiletries and skincare products. The walk in shower was powerful and the complimentry toiletries were actually really nice to use. I loved getting ready in front of the huge, well lit mirror and the magnifying mirror on the wall next to the sink was a handy touch too for applying makeup and for my husband, shaving. There was a hairdryer in the room and plenty of plug sockets for me to plug my straighteners in, charge my phone, etc. I decided to wear my Chloe dress from Monroe Knows. You can read about it in full detail here. An LBD is the perfect date night outfit in my opinion and I paired it with my black platform heels, new Chanel WOC and my pink Thomas Sabo bracelet. I went for a green smokey eye and a pink lip with Too Faced’s Melted Lipstick in Melted Fuchsia (review here) for my makeup look. We enjoyed a lovely supper out together and returned back to the hotel pretty late. It was quiet and peaceful and there was no noise or disruption in the corridors or coming from other rooms like you can get with other hotels. 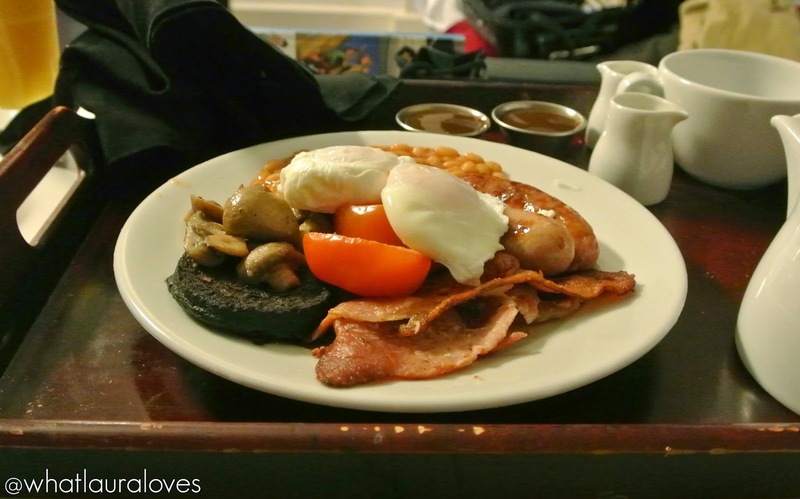 After an incredibly comfortable nights sleep, we awoke to our breakfast that had been delivered to our room. I have an injury that means that I often find it difficult to sleep in another bed, without my own pillow but the bed at the Sandman was very comfortable and we both got a very good, peaceful nights sleep. We couldn’t hear any noise in the room from outside which is rare for a city centre hotel and the room was at a very comfortable temperature. The room had heating and air conditioning which was very easy to control and quickly heated the room up and cooled it down when needed. Our breakfast was included in the cost of our room package and while there was the option of dining in the restaurant, we opted to have it in the room as we were given a late check out and wanted to relax before leaving for an afternoon of shopping. Pre-ordering breakfast was really easy to do, we simply had to fill out a card with our preferences and hang it on the door. The breakfast arrived at the time we specified and our order was completely correct. We both opted for a full english breakfast with poached eggs which were cooked to perfection, a coffee for Mr WLL and a tea for me. The portions were very generous and really set us up for the day. Check out was prompt and efficient and our bill was itemised accurately. Again, the service we received was second to none and rounded off our trip to the Sandman Signature nicely. We spent the rest our of day shopping in Newcastle which is one of Mr WLL least favourite activities but one that I certainly enjoyed! We would definitely stay at the Sandman Signature Hotel again, or at the Gatwick hotel if we were flying from the airport. 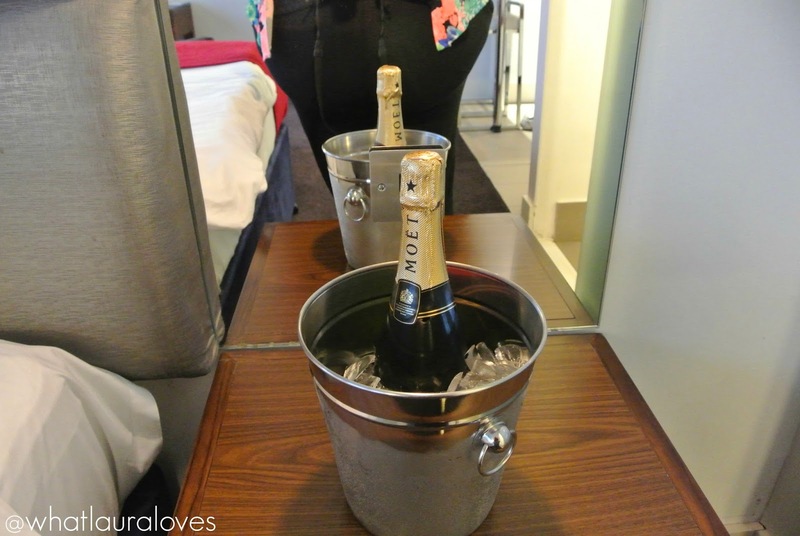 It is worth noting that the Sandman Signature hotel offers various different deals including a Romance Package which is similar to what we had when we stayed there for Valentine’s Day. You can find out all about their various deals here. You can visit the Sandman Signature Hotel website here and you can call the hotel on 0191 229 2600 to book. 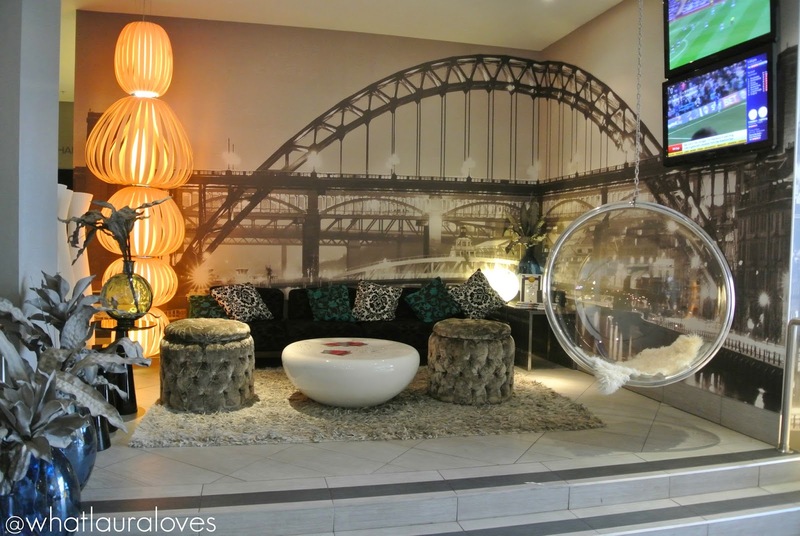 We would definitely recommend this hotel if you’re wondering where to stay in Newcastle when you’re travelling to the area. It is perfect! What a nice hubby you have and the hotel looks really fab – I am sending your post to my OH with a lot of hints..